Thanksgiving is an American tradition that truly celebrates family – a time in the year when relatives and friends get together and exchange notes on what’s gone by. But what does Thanksgiving mean to your kids? While they look forward to meeting their favorite uncles and aunts, maybe even receiving gifts from them, Thanksgiving has no special activity that caters exclusively to them. A whole lot of adults meeting to catch up on the family news, over an elaborate dinner, is hardly something to excite kids, so that they are largely left to themselves, and may end up feeling a bit left out. As a dad you can help your kids by explaining the meaning of Thanksgiving. Knowing about it and what it stands for will help them appreciate the essence of this celebration. 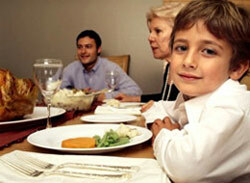 Getting children to help with preparing the Thanksgiving dinner could be another way to make them feel included. Not only does it make them feel responsible, they’ll look forward to the event of the actual dinner much more if they’ve had a role to play in its preparation.